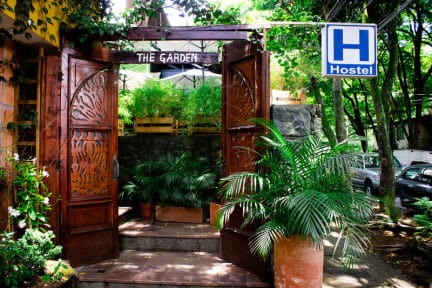 The Garden of Blues Hostal i Medellin, Colombia : Boka nu! LOVED this place. Clean and comfy, amazing staff, good location. 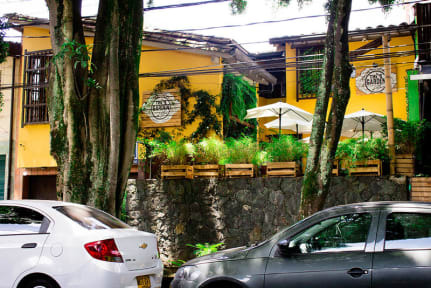 Right in the middle of poblado, close to restaurants and bars. A bit pricy but it was possible to find cheaper options. 20 min walk to the metro but it really didn't matter too much, was okey. Stayed in a 6 bed dorm, comfortable bed. Lockers. Good showers. Over all I had a really good experience! Recommend! A fantastic hostel. Lovely crew, very clean and good hang out areas. Very friendly staff! They spoke fairly good English as well and where eager to help. Good location. A little off from calle 10 the main street but still a nice more peaceful area. Breakfast was light but alright. Nice patio to have breakfast in and appealing common area. I stayed in the second building and enjoyed my stay although it was only for one night. Very nice and clean hostel, beds are great and room as well. Location is great. Nice hostel if you don't look for a party hostel. Staff could be more helpful! Don't stay here! The staff at this place couldn't care less about their guests. We were robbed nearby (terrifying experience) and when we got back to the hostel the receptionist was incredibly rude to us. We went outside to talk and all we got was that she didn't care about what had happened. My friend was crying and she told us we had to be quiet. Offering no help or sympathy at all. There are better hostels in Medellin. The price and location isn't worth it!